From the time I was a little girl, I’ve been climbing trees, falling, hurting myself, recovering, and then looking for another tree to climb, or another adventure. Pre-school, I fancied learning Bharatnatyam. What little child proposes, circumstances dispose; I had to switch schools, so I had to take what was available – athletics and basketball. The body itched for physical stuff, so I joined a gym. That’s where the story began. Many women shudder at the sound of gym believing it to be a place where fat people go to lose weight. They also believe that if they lift weights, they will get bulky. That’s a monster of a myth. Lifting weights does not make women muscular; it tones your body. Moreover, fat can only be lost through a healthy lifestyle, please understand that; nothing else will work. After two years, gym training did not satisfy; wanted to try something different, so I thought of kickboxing. I enrolled for classes in Kerala, went for a trial class and absolutely loved it. I trained every day of that summer and picked up the techniques very fast. I realised at one point, I was spending more time on training than what was required of me. However, I could not stop, for I was getting better, stronger, and certainly faster. 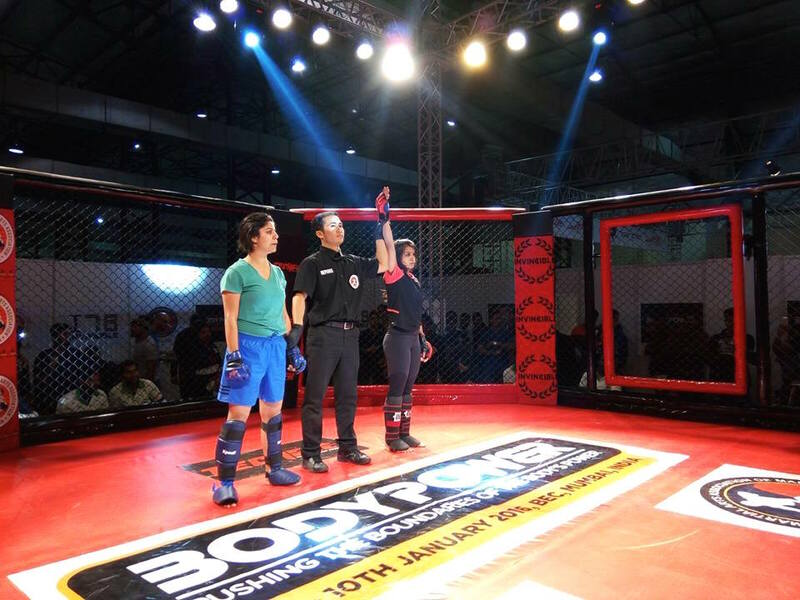 After that summer, I came to Bangalore and joined the Mixed Martial Art gym. I trained three hours a day, every day, and learnt 5 different martial arts – Judo, Muay Thai, Jiu-jitsu, Wrestling, and Boxing. My trainers recognised my talent, and encouraged me to complete. My first fight was an inter-collegiate Judo competition. I was placed second, but boy, was I scared. The first fight is always the worst. Let me share a secret, the feeling of fear never goes away, not even with experience. I am told that no matter how good or versatile a fighter is – from the maestro to the beginner, the person enters the ring with immense fear. Beyond all the outward bravado, let me tell you, it takes all of your heaven-deposited guts to be able to enter and stand for a competition, knowing that you are definitely going to get injured. Fear did not diminish my progress. 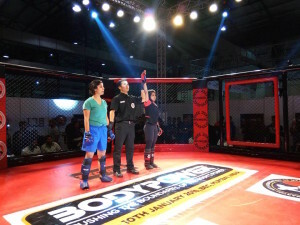 Soon, I started competing for Mixed Martial Art tournaments, in which you blend in all martial art techniques from ground game to stand up boxing. My training partners were always men, and they would go easy on me to start because “ladki hai”, but after I landed some heavy punches back at them, their kindness disappeared and I got back punch for punch. Because of God’s grace, I guess, I have always protected myself from heavy injuries though once, I had an elbow dislocation which barred me from training for a month. There have been occasional injuries on the nose. Blood clots on the body have been a common thing, as have been liver shots, round-house kicks, blue-black marks – stinging pain gets commonplace after a period of time and the body gets used to it. It is not about how hard you hit, how strong you are, or about the aggression, anger or rage. It is about mastering the art of how to be calm, knowing what technique to apply in response to which hit, and mainly about how to get back up every time you fall. It is about having a heartfelt respect for your trainer and your training partner; without them you are and will have nothing. It is about practising over and over again; not giving up, rising over tiredness. 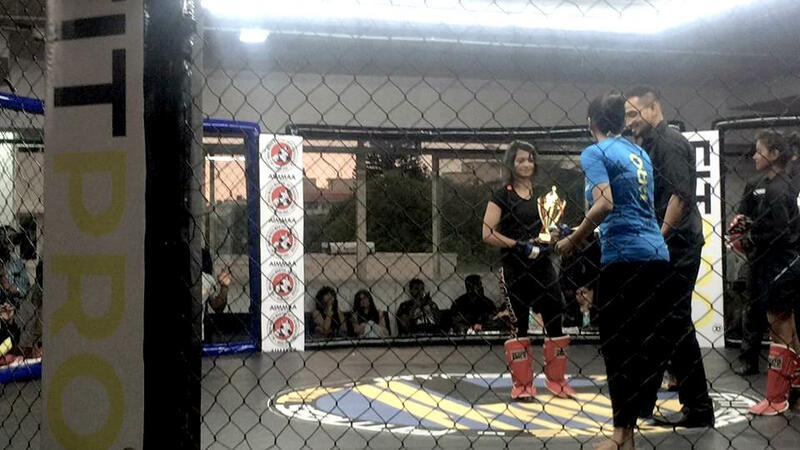 I won two competition after my first fight. I got selected for world championship. However, I am now seriously praying about whether or not I should pursue it as a career. There is not that much scope in India, the pay is not that great either. Training costs are very high. I will never stop training for I want to stay fit all the days of my life. 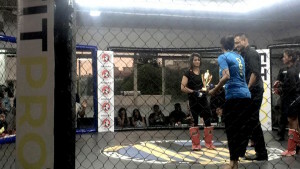 I doubt I would be able to resist a good opportunity to contest, but I must confess MMA will always be a hobby for me. My Bible tells me, aggression is not expected of women. Secondly, the Bible’s command is to be fearless, and the concept of fear is always present in this kind of sport. Thirdly, you have to be angry to fight – the Bible is not fond of anger. Finally, it’s not a good thought is it – to be punching people for a living? However, as violent as it may seem to the outside world, to us boxers, boxing becomes a way of life, a routine that builds up endurance, commitment and focus unlike anything else we know. Good preparation for life, wouldn't you agree?